I am a book worm, but sometimes my hectic life trumps my love of reading. Now in the summer I'm up late reading devouring books. Through any avenue I could find, I have researched books that would be suitable for read alouds and independent reading for my 5th graders. With 3 classes now, and in a middle school setting, I am going to try my hardest to dedicate time to read aloud! I want to share my two favorite kids' books that I've read this summer. 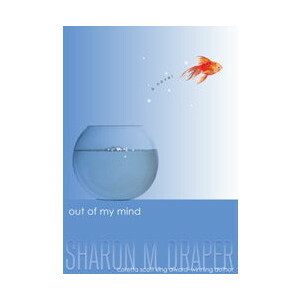 Out of My Mind by Sharon M. Draper was an excellent read, and hit close to home for me. Words, thoughts, feelings, descriptions, and the right answer to a question in class have never been able to come out of Melody's mouth. Melody, an 11 year old girl, has cerebral palsy. She is the smartest kid in the school but no one knows it because she can't speak and feels like she is stuck inside her head. Then Melody has a break-through when she discovers a way to share her voice. This book is honest, touching, and very real. I would recommend it to anyone, especially teachers who work with special education students. One central theme is inclusion, as Melody and her classmates from her substantially separate class are included in the general education when the school (finally) implements inclusion when she is in 5th grade. I am so grateful I found Melody this summer and look forward to sharing her story with my kids this year. 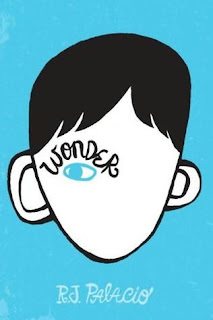 Wonder by R.J. Palacio has a similar theme of acceptance and I quickly loved Auggie (August) the main character who has a very rare condition that caused a severe facial deformity. He enters school - 5th grade - for the first time after being homeschooled his whole life. The book is told by many different perspectives - like Auggie's older sister who enters high school, and other kids whose lives become influenced by Auggie. I am going to introduce this book when teaching theme and our school values of inclusion, acceptance, and empathy. A quote that stuck with me, this one came from a teacher on the first day of school, "When given the choice between being right or being kind, choose kind" - Dr. Wayne W. Dyer. I want to somehow display this quote in my class because I want the theme in my classroom to be: Choose Kind. I make HW passes for every holiday but I NEVER thought to make ones for kids' birthdays! Once again, thank you Pinterest and the amazingly talented teachers I follow! 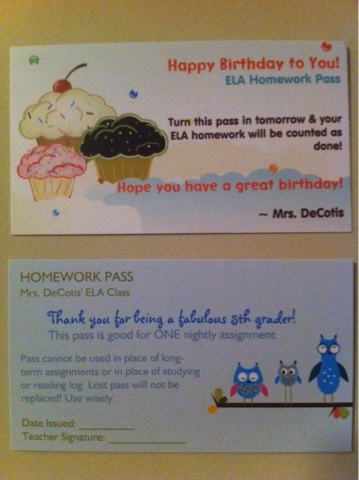 Here are my birthday passes and HW passes for being "Fabulous 5th graders!" I used Vistaprint's deal of 250 free business cards and only paid for shipping! I figured these would last me at least 3 years and I don't have to use my color ink at home. With close to 70 kids, I have to give the warning that lost passes cannot be replaced!